Priests, nuns, hookers, stigmata, featuring Marion Cotillard and Gary Oldman. 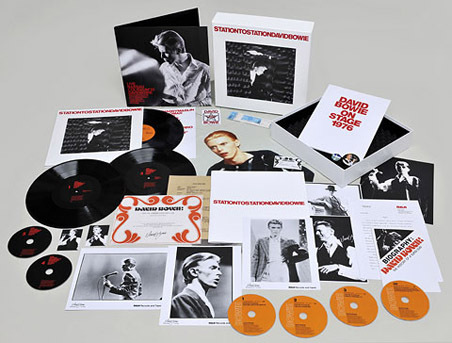 Much as I would like to adore every single thing David Bowie releases into our world, I’m on the fence about this one for now. Update: YouTube has removed the video for violating its terms of service. Huh. Phwoar, take a look at that! Now, to be honest every time I fork over money for ‘deluxe’ type releases, I end up thinking ‘Cool, now what am I going to do with that?’, never to touch the thing again. They end up gathering dust at the back of a shelf. Worse, I feel bad for having opened the item as it takes something off the value of it. Still… that’s one hell of a collectible. By coincidence I heard China Girl played in a shop today and it made me want to listen to Bowie’s entire back catalogue again. Pitchfork has details on the contents. Don’t you know you’re driving your mammas and pappas insane? A friend’s son turned 11 today and, spurred on by Mr Hg, I bought him his first David Bowie CD, fully intent on corrupting his young mind. I got him a Donald Duck comic and a scientific youth mag too, just to be on the safe side. He’s growing up quite sheltered and seems petrified of going to high school next year, where there are ‘bigger boys with gel in their hair’. I don’t think he was ready for the CD, but his mum liked it. I had hoped he’d pick up on the ‘space’ theme and be intrigued by Major Tom, but I forgot he doesn’t understand English yet. Hopefully he’ll remember the CD is his and will come back to it in a year or two. The two younger sisters asked me to teach them to eat with chopsticks, the minute I walked through the door. I think their hands were still a little too small to learn. Or I’m a crap teacher. The guy should be flogged. If I had kids, I’d only want the best of the best to teach them. Wouldn’t you? First it played: A live version of David Bowie’s version of the Pixies’ Cactus. At the end of the song he explains it’s either about a friend of Frank Black’s in prison, or maybe Black’s own experience in prison. Then it gave me: Frank Black & Two pale boys version of Cactus. Enter theme of the Twilight Zone. David Bowie, about an hour and a half ago in the Amsterdam Arena.